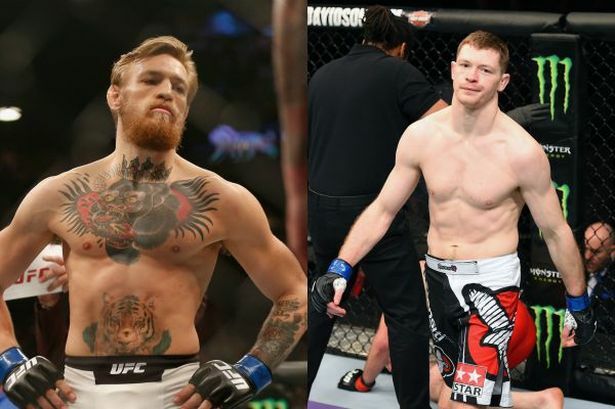 The Fighting Irish: Can Joe Duffy take down McGregor? Home / MMA / Will Raczkowski / The Fighting Irish: Can Joe Duffy take down McGregor? You can’t walk anywhere through Dublin Ireland without seeing that crazy bearded face. Conor McGregor is rapidly becoming Ireland’s answer to Michael Jordan, with pictures posted on billboards, television, and wall murals throughout the Irish city’s brick walled neighborhoods…and for good reason. The brash Irishman has dispatched increasingly competitive dance-partners with an alarming speed and ferocity. He’s been so dominant, that his two previous losses have fallen out of memory, as the world begins to rally behind the Irish slugger’s bravado, charisma and flawless crowd-pleasing style. But what about those losses? The first came in only his third professional fight, early into his promising career. Since that point, his opponent has compiled an iffy record of 15-13, and may have won more as a result of Conor’s inexperience, as opposed to his own fighting skill. The second loss however, came at the hands of UFC newcomer “Irish” Joe Duffy, who has shown no signs of slowing down since dispatching McGregor in his 6th pro fight (Duffys 7th). Since that victory, Duffy has tasted defeat only once in his 15 fight record, including two jaw-dropping finishes in his blossoming UFC career. McGregor himself has stated that he will move up to Lightweight within the foreseeable future, as the weight cut is beginning to take a toll on his body, and while battles with the likes of Nate Diaz, Donald Cerrone and Anthony Pettis have fans drooling, it’s his fellow Irishman in Duffy that would bring a true spotlight to one of Mixed Martial Art’s hottest new scenes. McGregor undoubtedly wants to avenge his loss to Duffy after demonstrating an incredible evolution as a fighter and athlete, and Duffy has also stated publicly that he not only wants to fight McGregor again…but that he intends to finish him again as well. But who is Joe Duffy? Duffy has compiled an astounding 14-1 record so far as a professional, dispatching his first two UFC opponents with ease. Initially scheduled to fight Saturday in the main event of the UFC Fight Night in Dublin, Duffy’s battle will be postponed due to a concussion suffered in the final week of training, and the main event fight is likely to be moved to one of the upcoming UFC Pay-Per-Views. Duffy was about to take a step up in competition, battling Louisiana scrapper Dustin “The Diamond” Porier in Ireland for what will surely be a packed house. Porier is an intense, hard punching, and extremely well-rounded fighter, accumulating an 18-4 record in spite of his young age of 26. He was brutally put down by McGregor 2014, but as a lightweight, “The Diamond” has reinvented himself and seems to be benefiting greatly from the lesser weight-cut. Duffy has a chance to establish himself as potentially the next big star from the Emerald Isle, with a win possibly setting up one of the biggest fights in the world, and certainly the biggest of Duffy’s career. The shadow of Conor McGregor looms over the entire UFC, and he’s a hero in his homeland. That said, the talented (but soft-spoken) Duffy, who took a brief break from MMA to establish an undefeated boxing record, seems increasingly ready to cast a shadow of his own. Armed with knockout power, proven submission skills and a natural finishing ability, Ireland may be preparing for a massive explosion onto the MMA scene. Two of the nation’s biggest stars are on a collision course, now we just have to sit back and wait for the fireworks. Who takes it? The fast-talking, money-minded, half Celtic warlord/half comic book villain of McGregor? Or will “Irish Joe” keep letting his fists talk for him, as he humbly, quietly, ascends the ranks toward his old rival? There is a war on the horizon to establish the true Irish warlord…does Duffy have what it takes to kill the king?